NOTE: Check with local and state laws before tinting your tail lights if vehicle will be driven on street. By reading this guide you will learn how to smoke your tail lights. Smoked or tinted tail lights have became popular, as it gives the car or pickup a cool effect. There are several ways to achieve this effect, but we are going to show you a way that outperforms the any other method and a fraction of the cost. 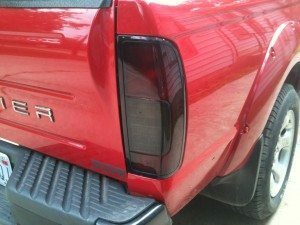 You can buy tinted aftermarket tail lights, but there are two problems with this method. One they are very expensive and the second is that sometimes they do not fit the vehicle as well as the original factory tail lights do. We are going to use the same OEM lenses that are already on the car, which is always going to provide a best fit possible. In addition to being expensive, most aftermarket parts are a lower quality than the OEM parts. The method that I am going to teach you is not a tint that may later change colors or peel. The method that I am going to teach is the way that I have taught my students. We have used this method on many tail lights with outstanding results. The first thing that you want to do is to remove the tail lights from the vehicle. This is not a very hard task, but certain steps must be taken to insure it is done properly. All cars vary, but on most vehicles, the trim in the trunk area will need to be removed. This usually only consists of a few screws and clips. Be careful taking the trim out, as you do not want to fold or crease it while removing. To do this step, you will need a regular and phillips screwdriver and a trim removal tool. Some cars may require other basic tools, but the screw driver and trim tool usually is enough. Care must be take removing plastic clips and they break easy. This is where trim removal tool comes in handy. Another tip that I can give you on any size of job is to bag the hardware. This may seem unnecessary for such a small job as tail lights, but accidentally kicking a screw and loosing it is something that can result if not bagged. One screw or clip can cause you a lot of time searching for it and maybe even a trip to the auto parts store to buy a new one. This may even take several trips if one store does not stock the certain bolt or clip that you are looking for. Therefore, take just a minute to place the hardware in a baggy. You may even want to have one for the left side and one for the right side and label each bag to prevent confusion when putting the tail lights back on. This does not take long, but simplifies the process, when it is time to put the tail lights back onto the car or pickup. After the trim pieces covering the tail lights have been removed, you should have access to the backside of the panel that the tail lights are mounted to. If you are working on a pickup, you can skip this part. However, as in the video, we did have to loosen the bed liner to gain access. Using a socket set with the correct socket size remove the bolts that are securing the tail lights in. As always, there are various ways that the tail light may be attached. This is where you may just have to examine the parts and determine the best way to remove them. Once the light assembly is loose, you will need to unplug or remove lights from the tail light assembly. Care should be taken not to damage the bulbs during the removal process. If you have a third tail light, you may consider smoking it as well. I think it looks out of place if the third light is not tinted, but I have had students and customers prefer it done that way. So this will be a preference if you or your customer wants the third tail light tinted or not. It is important to remove all the contaminants before starting the tinting process. You can do this by washing with soap and water. Use a dish soap without hand treatment to keep hands soft use a car soap that does not have any waxes in them. After washed thoroughly rinse and dry with compressed air. Some tail lights have chrome around them or areas that you do not want to have sprayed. Therefore, go ahead and mask those areas at this time. The reason that you want to do this now is to prevent scratching these areas when sanding. Sand the tail lights with 800 – 1200 grit sandpaper. This is to create mechanical adhesion for the clear coat to bite to. Be sure to sand edges good, as this is where it is where peeling could occur if the clear coat does not adhere properly. You a gray or yellowish fine (Do Not Use Red) scotch-brite scuff pad to scuff the parts to assure everything is scuffed well. A scotch-brite scuff pad can get to places that sandpaper can’t reach too good. Now that the tail lights are sanded and scuffed, you can wash them again to assure they are completely clean. Do not use any type of solvent cleaner on plastic such as wax and grease remover. This can result in problems when clearing. Once washed, blow them dry with compressed air. Water will hide in crevasses so be sure all traces of water is remove. I have seen water pop out when clear coating from the air pressure from the spray gun, which will show up in the finished product. The lights are washed and dry, now we can begin to spray them. Place them in a clean area like a paint booth to spray them at. You will need to place them on a stand that will hold them without moving around. Hanging parts are hard to spray as they move from the air pressure. For tail lights, a table works well, as you are only spraying the front side. This will allow you to lay them down on the table. Be sure to set them too close together. This will make it difficult to spray around the edges. Before you mix your tinted clear, wipe the tail lights off with a tack cloth to assure that all lint and dirt are off. Do not use wax and grease remover on plastic, as you would a painted surface. Next, spray the tail lights with a light even coat of adhesion promotor for plastic. It is important not to spray this too thick and you must wait at least 5 minutes. However, if you wait longer than 24 hours you must reapply the adhesion promotor before spraying the clear coat. This is a process of mixing a black base coat and clear coat together. Be certain to check with your paint supplier to make sure this will be compatible with each other. I use PPG and ShopLine and I know these two brands work fine. I will give you the product information below in the resources. Mix clear coat and catalyst together, as you normally would. Now mix base coat with reducer as you normally would. Now that you have mixed clear coat and mixed base coat. Next, pour 2 parts of mixed clear with 1 part of mixed base. This will make a translucent black. Basically, a candy coat. That may be a little confusing if you are not familiar with mixing paint. Let me give you an exact formula. The clear coat that I use mixes 2:1. So if I used 4 oz. of clear, I would add 2 oz. of catalyst. This certain clear does not use a reducer. Now I have 6 oz. of mixed clear. The base coat I use mixes 1:1. Now I mix 1.5 oz. of base coat with 1.5 oz. reducer. This gives you 3 oz. of mixed base coat. Mix the 6 oz. of mixed clear with 3 oz. of mixed base coat. This now makes 9 oz. of sprayable tinted clear to use for your tail light job. 9 oz. is plenty of tinted clear to do one job. Therefore, a quart of clear goes a long way for doing tail light jobs. If that makes since, just remember 2:1 – 2 parts of mixed clear to 1 part mixed black base coat. The tinted clear is mixed and ready to pour into your spray gun. Pour the tinted clear coat in and adjust your gun and apply 1 coat on the tail light. If you have never done this I recommend that you practice a little first to get your spraying technique. I have a link to a spraying tutorial in the resources below. Now you basically spray the number of coats to achieve the desired darkness. Be certain to wait the recommended wait time between coats. The clear coat that I use requires a 15 minute flash time (wait time) between coats. 2 to 3 coats are usually sprayed to produce the desired shade darkness. I don’t like them as dark as most of my students do, so 2 coats worked fine for me in the video. The best way to determine how you will like them to spray a let down on a spare tail light. If you have an old tail light, it will work good to practice on. You can use it to determine how dark you will want to spray your tail lights. For example, you can place 4 pieces of tape the tail light side by side. Spray a coat on and pull the first layer of tape off. Then spray two coats and pull another layer of tape off. Do this until you have pull all the tape off? Now you will have a tail light with one coat, two, coats, three coats, etc. This will allow you to see what your tail light will look like with the different amount of coats. Each additional coat will make it darker. I have always had good luck with two coats, but you may want them darker. That is basically it! Now allow them to dry, then reinstall the lights to the vehicle. Now you have a set of quality OEM smoked tail lights with a high quality automotive grade coating that will last. What If I Cannot Figure Out How To Remove Tail Lights? I suggest taking the tail lights off, but if that is not possible, you can mask around the tail lights and spread plastic around the vehicle and tape the plastic to the masked areas around the tail light. Do this, after the tail lights have been washed and dried, mask the edges around the tail light. This may be masking the edge of the panel or if the tail light trim or chrome. Use 3/4” tape to outline the areas that you do not want overspray on. Next, use 2” tape to go around the 3/4” to make a wider area to tape the plastic to. Now you can drop plastic over the entire car and cut two holes where the tail lights are located. Then tape the plastic edge to the tape. This will make a complete seal around the tail lights. Caution: Make sure the plastic is tight around the tail light. You do not want the plastic to be able to blow around and end up hitting your tail light with plastic when spraying. Body shops usually buy plastic that cover cars when painting in rolls. However, it you are just doing 1 or 2 cars, you do not want to buy that much plastic. You can go to a paint store like Sherwin Williams or Home Depot to buy cheap drop plastic the painters use to protect carpet. This is something that you will need to be careful about. Take extra steps to clean the lights and spray them in a clean environment. However, since you are using an automotive grade clear coat, you can sand and buff them like you would paint. I am going to include one of my buffing tutorials. This was written for buffing a car, but all of the same techniques can be used on your tail light. Can you please give me more info on the type of adhesion promoter that you use on the tail lights? I would like to know specifically which product you use for this. Thanks so much for making this awesome tutorial, it has been very helpful and informative!